By 1911 Mabel was a servant at Nuttall Temple, near Nottingham; whilst the boys were all living at home. Harold was an ironstone miner, George was a domestic gardener, Albert (16) was a butcher’s improver and Charles (14) was a farm boy. During the Great War Harold joined 3rd Battalion Lincolnshire Regiment on 7th Aug 1914. He may have had previous territorial service because he was promoted L/Cpl the following month. After training at their Grimsby depot he was sent to France in Nov 1914. He was wounded at Ypres in Jan 1915 and again at Loos in Sep 1915, while taking back prisoners from a captured German trench. His friend Ralph Hutchinson, also of Fulbeck, died in the same action while trying to save him. Harold was promoted to Cpl in Jun 1916 and returned to the UK that October. George joined the Grenadier Guards in April 1918, but only seems to have served at Aldershot. 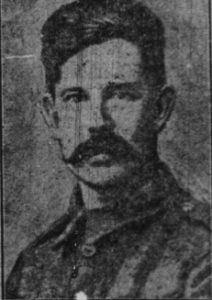 Albert Cooling joined 1st Battalion, Lincolnshire Regiment on 30 Aug 1914. Like Harold he may have had previous service as he was promoted L/Cpl the following month. After training at Grimsby he was sent to France in Jan 1915. He was wounded in action during the 2nd Battle of Ypres on 23rd May 1915 and died the next day. The 1st Lincs had taken over the front line trenches astride the Comines-Ypres Canal on 22nd April and held the position for 5 weeks without relief. The 23rd May was cold and windy. The front line was reported as quiet, but an artillery duel lasted all day. During the afternoon heavy rifle-fire was heard on the left of the battalion. A night patrol reconnoitred the enemy’s wire entanglements and threw grenades into the German trenches. Albert is buried in Bailleul Communal Cemetery Extension and commemorated on the Fulbeck War Memorial. During the Great War Francis joined 56th London Division, Royal Field Artillery on 7th Sep 1914. He served in Ireland to Sep 1915, then the rest of the war in France. He was promoted to Bombardier in May 1916. Wilfred joined 1st Garrison Battery, Suffolk Regiment in Jan 1916. He served in Tilbury until Mar 1917 and then Egypt. In Jan 1918 he was promoted to Cpl and moved to Palestine. Edward joined 3rd Lincolnshires in Apr 1918 and served in Ireland before moving to France in Sep 1918.